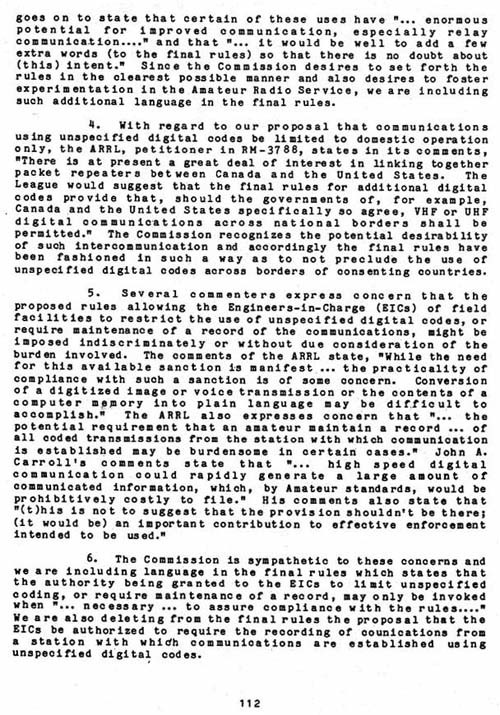 goes on to state that certain of these uses have " ... enormous potential for improved communication, especially relay communication .... " and that " ... it would be well to add a few extra words (to the final rules) so that there is no doubt about (this) intent." Since the Commission desires to set forth the rules in the clearest possible manner and also desires to foster experimentation in the Amateur Radio Service, we are including such additional language in the final rules. 4. With regard to our proposal that communications using unspecified digital codes be limited to domestic operation only, the ARRL, petitioner in RM-3788, states in its comments, "There is at present a great deal of interest in linking together packet repeaters between Canada and the United States. The League would suggest that the final rules for additional digital codes provide that, should the governments of, for example, Canada and the United States specifically so agree, VHF or UHF digital communications across national borders shall be permitted." The Commission recognizes the potential desirability of such intercommunication and accordingly the final rules have been fashioned in such a way as to not preclude the use of unspecified digital codes across borders of consenting countries. 5. Several commenters express concern that the proposed rules allowing the Engineers-in-Charge (EICS) of field facilities to restrict the use of unspecified digital codes, or require maintenance of a record of the communications, might be imposed indiscriminately or without due consideration of the burden involved. The comments of the ARRL state, "While the need for this available sanction is manifest ... the practicality of compliance with such a sanction is of some concern. Conversion of a digitized image or voice transmission or the contents of a computer memory into plain language may be difficult to accomplish." The ARRL also expresses concern that "... the potential requirement that an amateur maintain a record ... of all coded transmissions from the station with which communication is established may be burdensome in certain cases." John A. Carroll's comments state that "... high speed digital communication could rapidly generate a large amount of communicated information, which, by Amateur standards, would be prohibitively costly to file." His comments also state that "(t)his is not to suggest that the provision shouldn't be there; (it would be) an important contribution to effective enforcement intended to be used." 6. The Commission is sympathetic to these concerns and we are including language in the final rules which states that the authority being granted to the EICs to limit unspecified coding, or require maintenance of a record, may only be invoked when "... necessary ... to assure compliance with the rules .... It We are also deleting from the final rules the proposal that the EICs be authorized to require the recording of communications from a station with which communications are established using unspecified digital codes.